Karen A. Cramer was born in Washington, D.C. and is a graduate of the District of Columbia Public School System. While still in high school, Karen worked in the Office of then Vice-President Richard Nixon. After graduating from high school, she worked in the Analysis Branch, Office of Special Investigations, US Air Force (the “F.B.I. of the Air”). While attending the University of Maryland, she worked for USS Carl T. Curtis (R-Neb), before moving to the Astronaut Activities and Briefing and Protocol Office, NASA Headquarters. This afforded her the opportunity to meet the first three generations of astronauts. Having worked in the Senate, Karen was offered a position in the Congressional Liaison Division, Office of Legislative Affairs, NASA Headquarters. She was eventually promoted to secretary to the Deputy Assistant Administrator for Legislative Affairs. That was where she met and married Jack Cramer. Upon the birth of their first child, Karen left government service to become a full-time mother. She and Jack eventually had and raised two sons and a daughter. The Cramers purchased their first Ocean City condo in 1977. Upon Jack’s retirement, they moved to Worcester County and became full-time residents, first in Ocean City and then in Ocean Pines. All three Cramer children graduated from Stephen Decatur High School. 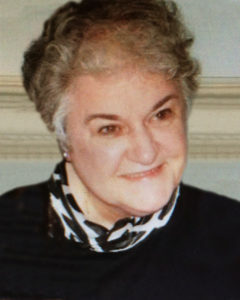 During their years in Worcester County Public Schools, Karen was actively involved in her children’s education, serving on many committees and participating in many fundraising events. All three of the Cramer kids were active in the theatre program at SDHS. Having Gwen Lehman in her children’s lives made her commitment to the Friends of Gwen Freeman Lehman Scholarship Foundation only that much more important. To see Gwen’s love of reaching young children and making a positive difference in so many children’s lives made her want to ensure that Gwen’s legacy would continue for many years to come. For over fifty years, Karen has given countless hours as a volunteer for the American Cancer Society, in the past serving as its president. One of the founders of the Holiday Wrappings Fashion Show and Luncheon, Karen has worked on the committee for twenty-eight years. Her involvement with Friends of Coastal Hospice began in 1986 when her mother was diagnosed with cancer. She has served as a hospice volunteer and had served on the “A Taste of Finer Things” fundraising committee since its inception.